Master Lock offers the tools & resources to help you choose the right door hardware for you and provides information on installation and maintenance. At Master Lock, we want you to be sure that you have selected the door hardware product that best suits your needs. Here is some helpful information to aid in the selection process. Which function is right for you? These door hardware products provide a dead locking mechanism that keeps the door from being opened without a key on the exterior side of the door. They can come keyed on the exterior side with a thumbturn on the interior side. A single cylinder deadbolt is normally used on a front or back exterior door and is operated with a key from the exterior of the home and a thumbturn from the interior. A double cylinder deadbolt is typically used on a front or back exterior door and is operated with a key from both the exterior and interior of the home. Double cylinder deadbolts are recommended when a window is in close proximity to the door. The interior keyway prevents an intruder from accessing your home by breaking the glass and turning the thumbturn to open the door. Please check your local fire codes. A handleset is operated with a key from the exterior of the home and a thumbturn from the interior. These can be used in places such as entry doors, garage doors or in combination with a deadbolt product. 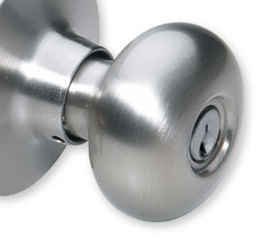 A locking interior door product is normally referred to as a "privacy" or "bed and bath" door knob. This product is equipped with a turn or push button on the inside and comes with an emergency release on the outside that allows the door to be unlocked by inserting an emergency release tool. Non–locking products are normally referred to as hall & closet or passage door knobs. These products have a latch that retracts when they are turned to allow entry, but do not provide a locking function. These are typically used in applications that do not require a latch. An example would be a pantry that uses a magnetic latch. You can use the information contained here to find helpful definitions of commonly used terms to aid with the selection process. The measurement between the edge of the door to the center of the hole drilled for the lock. The piece of metal that protrudes and secures or closes a door. The round assembly of the lock which provides the ability to lock a door through the tumbler and the keyway. A lock whose latchbolt is engaged by using a key or a thumbturn. A term used to describe a stationary piece of door hardware that does not provide any latching function for the door. The color of the metal of the door hardware. The type of door hardware used by a specific entry or door. Example "Bed/Bath", "Hall/Closet" or "Entry". Both knobs locked or unlocked by outside key or thumbturn inside. Some styles of levers are handed, usually due to a curved lever design. There are left–handed levers and right-handed levers. To determine the appropriate handing for your door, look at the hinges from the exterior side of the door. As you stand outside facing the door, if the hinges are on the left, you require a left–handed lever. If the hinges are on the right, you need a right–handed lever. The door hardware that encompasses a grip or handle along with a deadbolt function to lock the door. The area on the face of a keyed product where the key is placed. A door set consisting of inside and outside knobs. The mechanism that throws the bolt or closes the door when the door is closed. A door set consisting of inside and outside levers. The circular plate surrounding the knob or lever that is flush against the door. The metal attachment that is mounted onto the doorframe. The small knob or lever turnpiece on the inside or inner trim that operates the deadbolt function. The measurement of the projection of a deadbolt latch. The small moving part on the grip of a handle that is depressed when opening a handleset. The following information is designed to provide assistance pre–purchase and post–purchase and will help ensure that you choose the right Master Lock for your application. All Master Lock products are packaged with installation instructions. If the package you have purchased does not contain installation instructions, please download your instructions below. You will need to know the the model number which can be found on the package. When choosing door hardware, there are two types of installation. For new construction or remodeling, new doors can be purchased with or without pre–drilled holes. Adding locks to doors with pre–drilled holes is a simple process for the average do–it–yourselfer. If you choose a door without pre–drilled holes, you will need to prepare the door for the hardware installation. This preparation includes drilling holes in the edge and in the face of the door which can be a complicated process. If you feel this preparation is beyond your capabilities, many home centers and specialty door shops will drill the holes for you. On the edge of each door with pre–drilled holes, there is a door latch cut–out. This cut–out usually comes in "radius edge" or "square edge". Less common but more prominent in certain areas of the country is a "drive–in" door preparation. If the door has a 1" hole drilled in the edge, a latch is "driven" into the door, wedging it into the core of the door. Most standard doors have a thickness of 1–3/4", but it is necessary to measure this dimension to determine what your needs are for your door hardware. Please refer to the installation instructions and technical specifications of each Master Lock product to make sure your door and the door hardware you choose are compatible. The backset is the measurement between the edge of the door to the center of the hole drilled for the lock. Several types of latches are available, and normally are adjustable from 2–3/8" to 2–3/4". To determine your backset, measure the distance from the center of the hole drilled in the face of the door, to the door edge. 1/2" beveled latch used primarily for interior doors (interior locking and non-locking functions). 1/2" beveled latch with a deadlocking bar used for keyed applications. The deadlocking bar prevents the latch from being forced back and deters credit card entry. 1" throw bolt that locks into position and cannot be forced back. It contains a hardened steel pin to prevent saw through attempts. The ANSI/BHMA industry standards exist to help identify the quality and durability of locksets via a series of operational and security tests. Following is a guide to how the standards are set. BHMA (Builders Hardware Manufacturers Association( is accredited by the American National Standards Institute (ANSI), a private non–profit organization that administers and coordinates the voluntary standardization to develop and maintain performance standards for builder's hardware. ANSI/BHMA standards set forth different product grades for door hardware products. These product grades are defined by progressive levels of performance benchmarks in each applicable standard.